A split level 5 bedroom lake front property where everyone has their own space, peace and privacy to explore and enjoy. 5 Bedrooms and 2 Bathrooms on two levels is perfect for extended family groups and friends on holiday together. Quality comfortable contemporary furnishing add to this rich and welcoming setting by the lake. 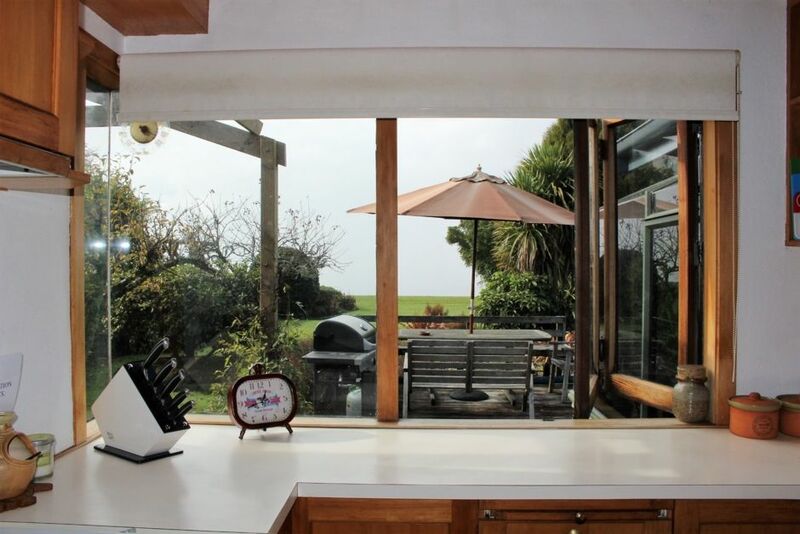 Well suited to outdoor enjoyment with 3 French doors opening out onto the deck side BBQ area. Year round comfort and scenery which change with the seasons. A heat pump/ air conditioner and 2 large wood burners, cushions, throws and rugs in the corner seat nooks make the ideal place to lose yourself over many idle hours. Outdoor enjoyment and loads of space to enjoy in the Summer. Security alarm installed, secure locked box for entry keys. Sky/cable TV with channels including Sports, ,, Country TV and all basic channels including UKtv Living channel, Crime and Investigation, BBC Knowledge, National Geographic, History and all the children's and music channels. A baby gate on the stairs and a gate to secure the play area on the deck especially suited to the little ones to be safe and secure at the lake. Lakeside accommodation for up to 10 guests, we must stress this is a residential location so noise after 10pm must be restricted to indoors. All firewood is supplied and included in the rental charge. Cleaning is compulsory at $100.00 per booking. This is a very quiet residential location so a respectful level of noise is appreciated after 10pm in the evening. We ask that you keep all noise indoors after 10pm and outside noise to a reasonable level during the day. Située dans une zone artisanale de NGONGOTAHA la résidence est très bien située face au lac. The house was very tidy, heaps of rooms and beds for a bigger group. The house was very tidy, heaps of rooms and beds for a bigger group. There is a nice big deck with two bbqs. The area is nice a quiet. Excellent location - enjoyed the view on the lake and peaceful surroundings. Excellent location - enjoyed the view on the lake and peaceful surroundings. Worked out well for our big group! Thank you! Very comfortable place heaps of character and charm with lots of indoor and outdoor space . Very comfortable place heaps of character and charm with lots of indoor and outdoor space . Everything you could want in a place to stay , location , views , facilities , comfortable beds .Perfect for large groups or family cant speak highly enough about the place a credit to the owners and property manager . Beautiful location, right on the lake. Beautiful location, right on the lake. House is well appointed and cozy. Would definitely recommend this property to friends and family intending to visit the area. An excellent homely property with all we needed provided. An excellent homely property with all we needed provided. Comfortable and clean as well. I recommend this to large families..